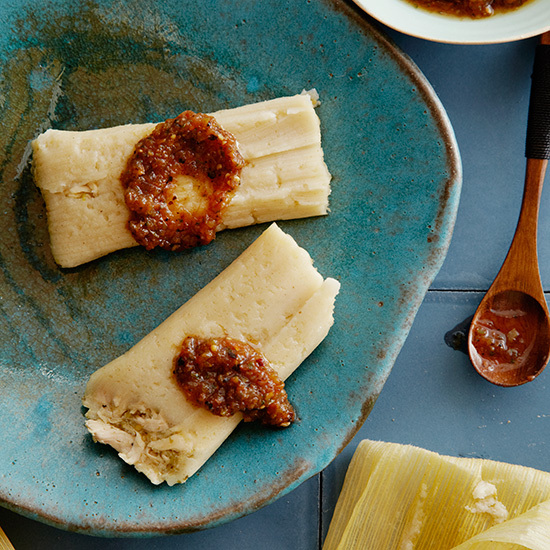 With creamy masa dough and tender shredded chicken, these delicious homemade tamales get a kick of flavor thanks to a vibrant tomatillo-cilantro salsa. 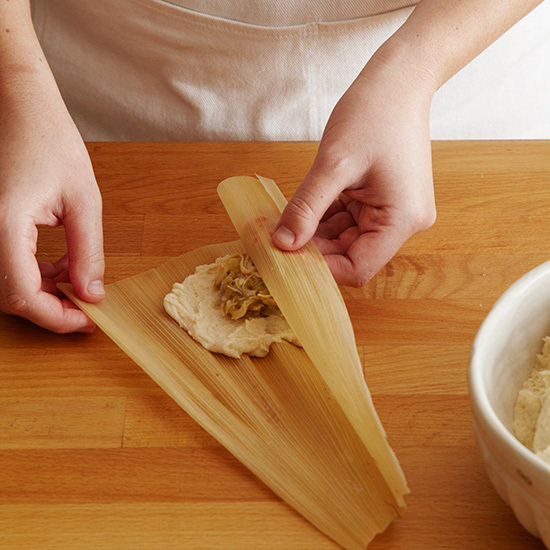 To host a tamale-making party, prepare the components in advance and set them out; guests can make their own tamales from start to finish or work together assembly-line style. Lay out paper for wrapping, pens for labeling and resealable plastic bags for transporting uncooked tamales home. 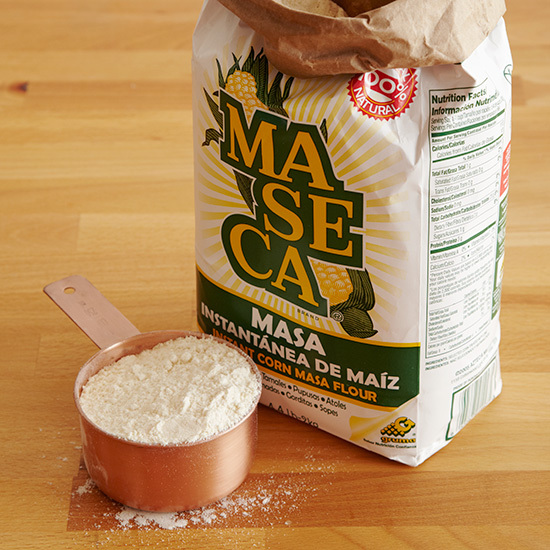 Masa harina, made from corn, is the key ingredient in tamale dough. 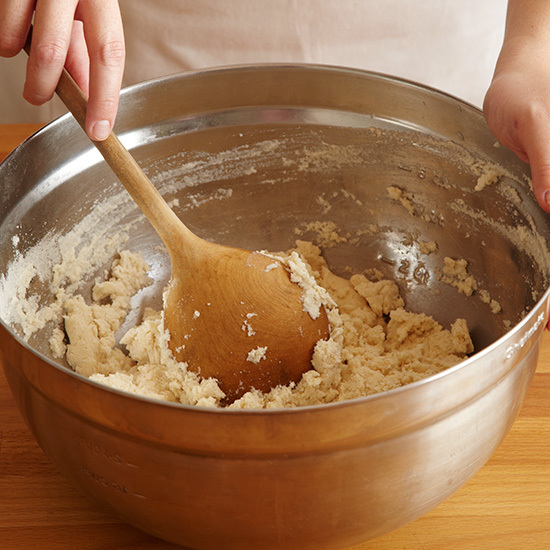 In a large bowl, stir the masa with the hot water until evenly moistened. 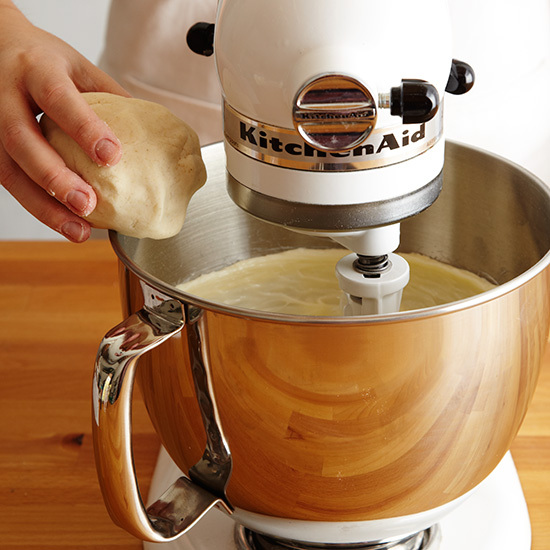 Knead several times to make a smooth dough. 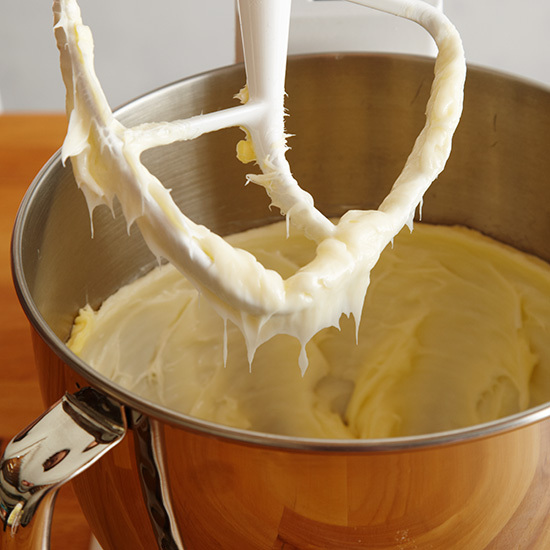 Add the salt and baking powder and beat at medium-low speed until incorporated. 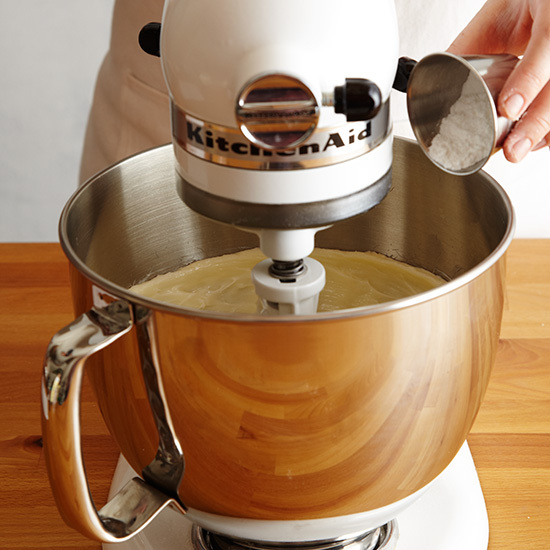 With the machine on, add the masa in 4 batches, beating until smooth and scraping down the bowl occasionally. 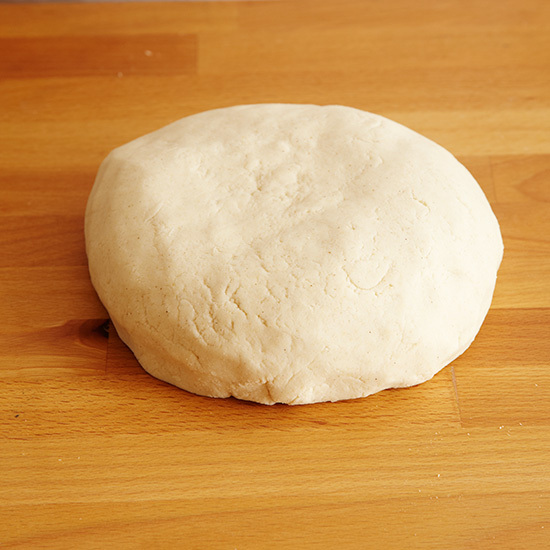 Pour in the stock in a steady stream and beat until the dough is fluffy and soft. 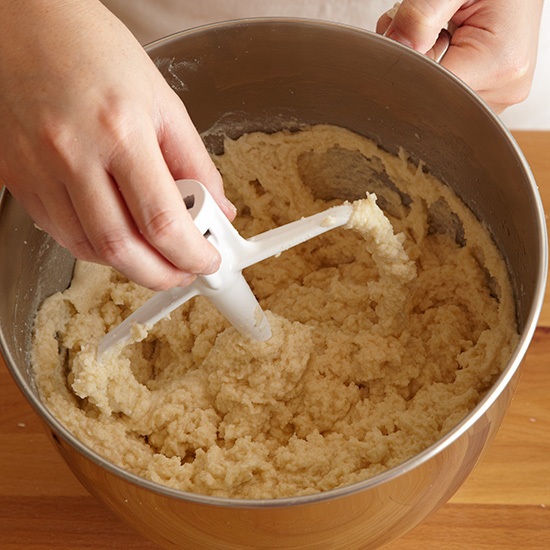 It should have the consistency of thick corn bread batter. 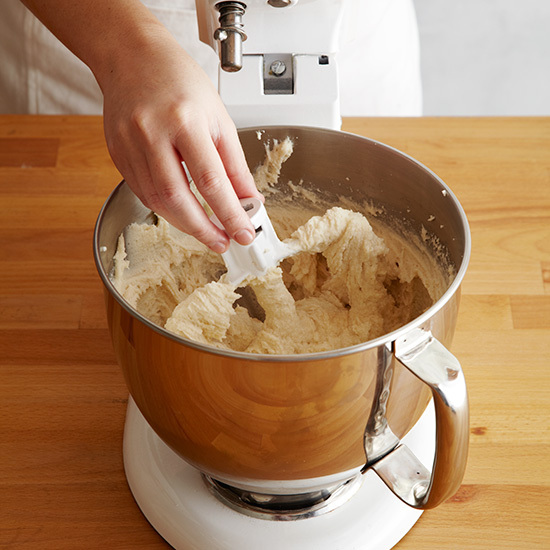 Refrigerate the tamale dough in the bowl for 30 minutes, then return the bowl to the mixer and beat the dough at high speed for 1 minute before assembling the tamales. Bring a large pot of water to a boil. 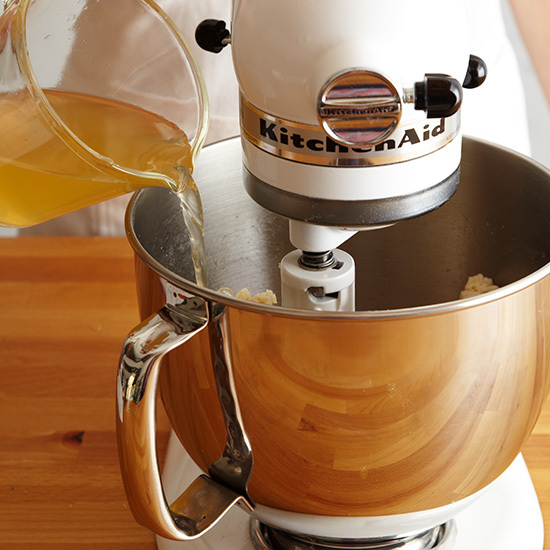 Add the cornhusks, remove from the heat and let stand, turning the husks once or twice, until softened, about 2 hours. Drain the cornhusks and shake off as much water as possible. 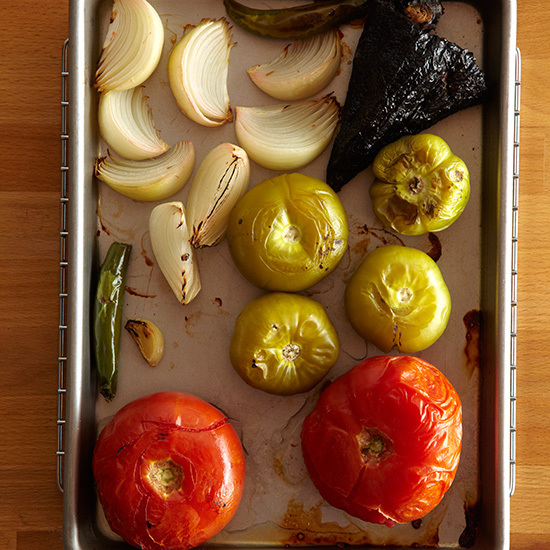 In a medium roasting pan, toss the tomatillos, onion, garlic and chiles with the oil. Roast, stirring twice, until the vegetables are very soft and browned in spots. 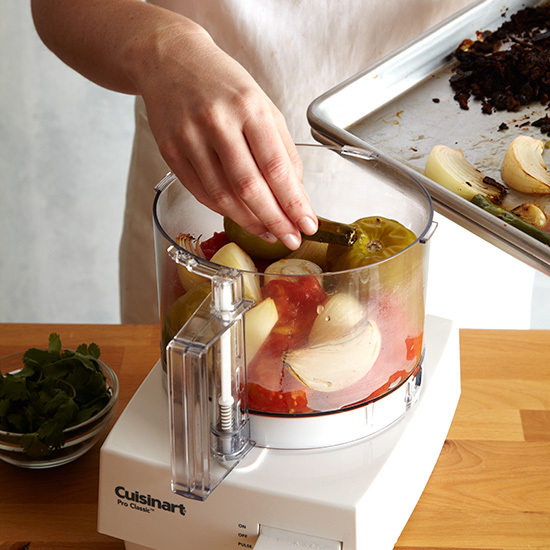 Transfer the vegetables and any juices to a blender or food processor. 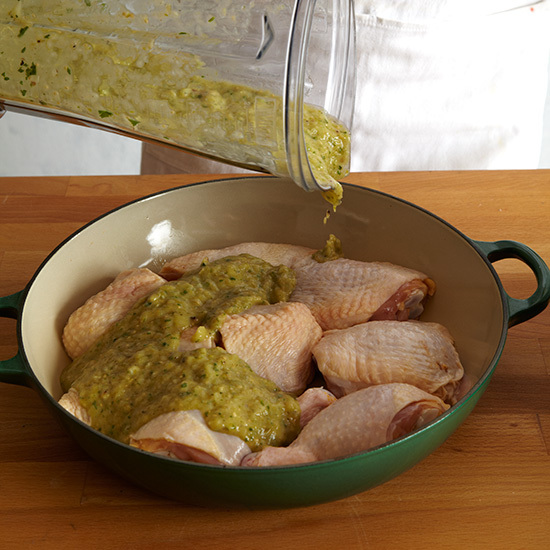 Add the lime juice and cilantro and puree until smooth. 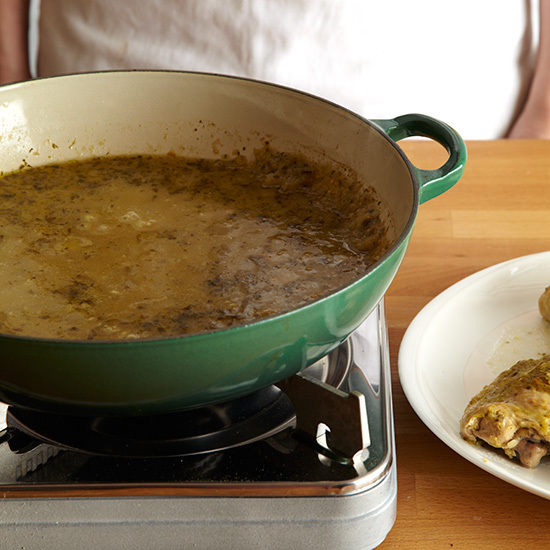 In a large enameled cast-iron casserole or Dutch oven, pour the sauce over the chicken. Cover and braise in the oven until the chicken is cooked through. Remove the chicken from the pot and let cool slightly. Set the pot over moderately high heat and boil the sauce, stirring frequently, until reduced to 2 1/2 cups. 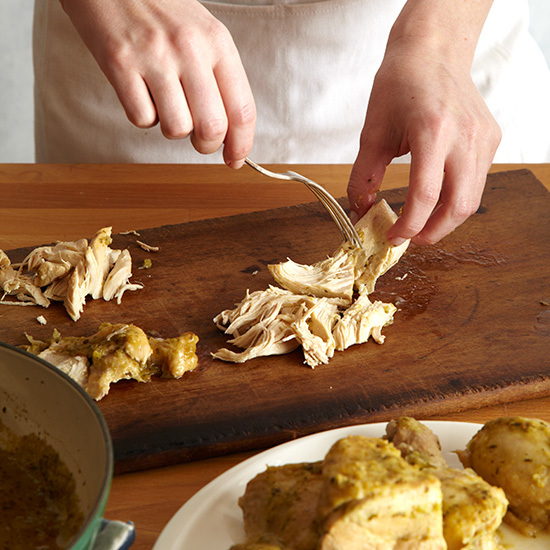 Discard the chicken skin and shred the meat into bite-size pieces. Add the chicken to the sauce and let cool completely. Arrange 1 husk on a work surface with the narrow end pointing away from you. 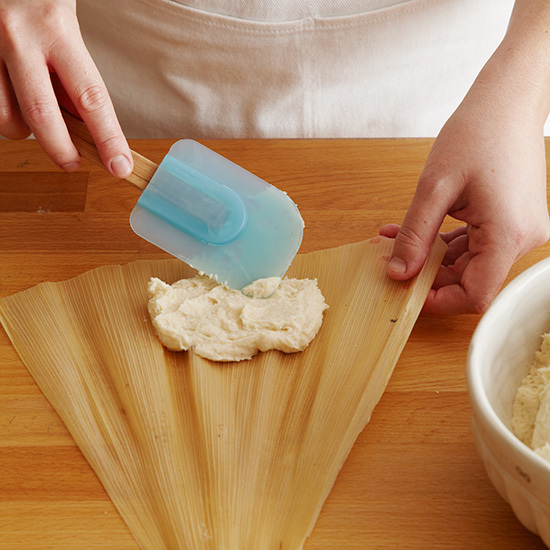 On the wide end, spread 3 tablespoons of the Tamale Dough in a 5-by-3-inch rectangle, leaving a 1/2-inch border of husk at the bottom. Spoon 2 tablespoons of the cooled filling in the center of the Tamale Dough. 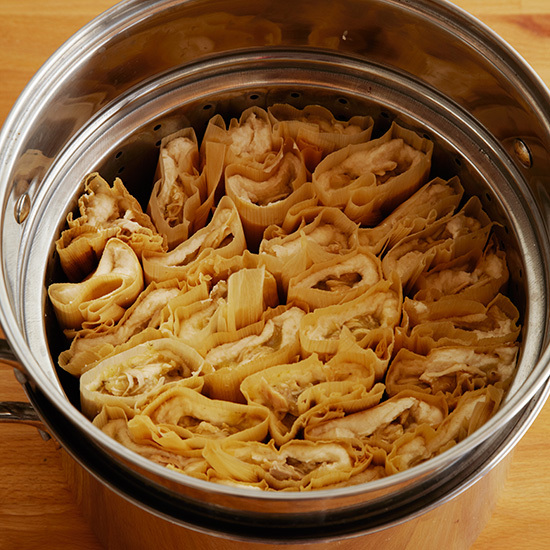 Fold in the long sides of the husk, overlapping them to enclose the filling. 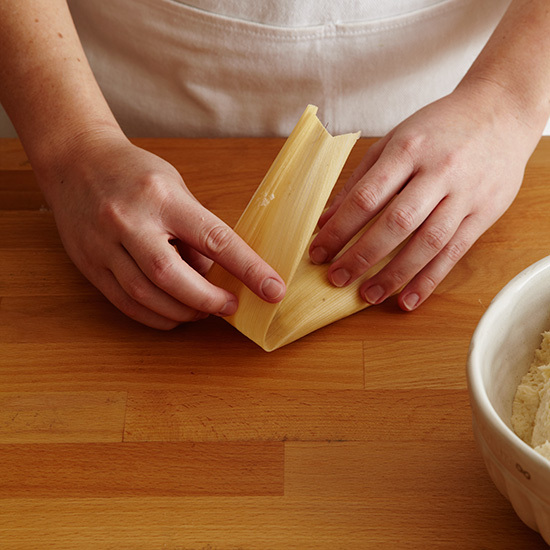 Fold the narrow end toward you, over the tamale; it will be open at the wide end. Stand the tamale, open end up, in a very large steamer insert. 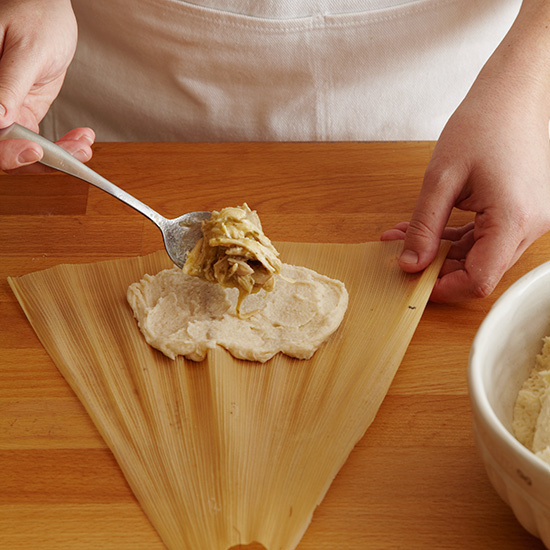 Repeat with the remaining cornhusks, tamale dough and filling. 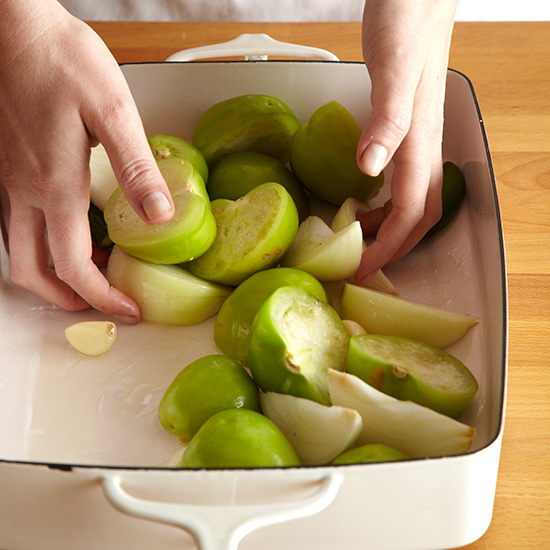 Fill the bottom of the steamer with 4 inches of water and bring to a boil. 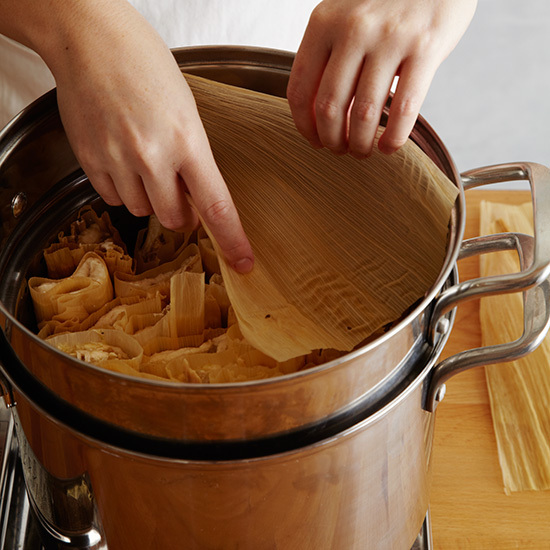 Add the tamales, spread some of the remaining cornhusks over the top and cover with the lid; wrap foil around the edge if necessary to make a tight seal. 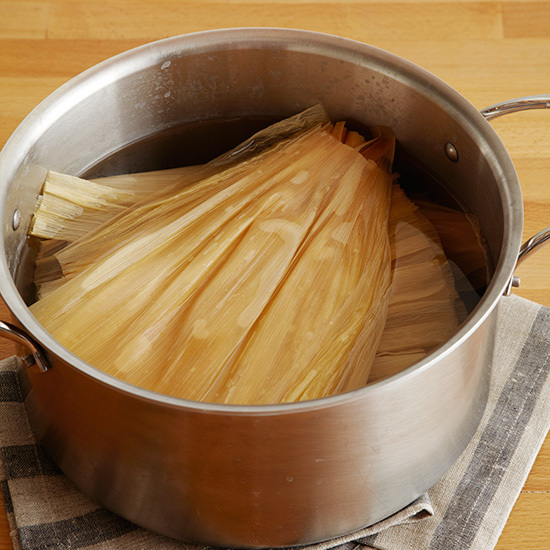 Steam the tamales over moderately low heat for 1 1/2 hours. Uncover and let cool. 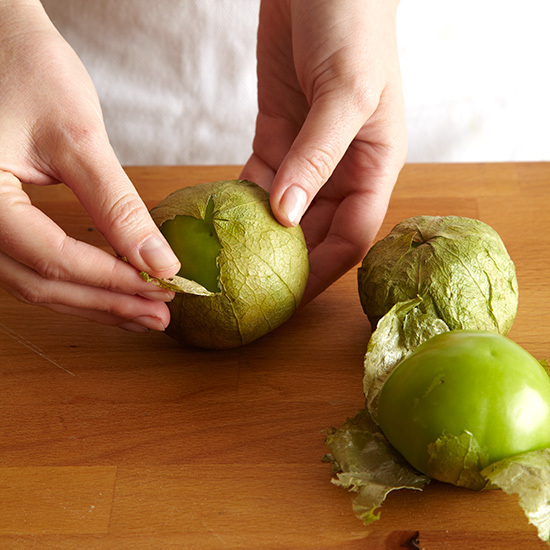 Peel the husks off the tomatillos. 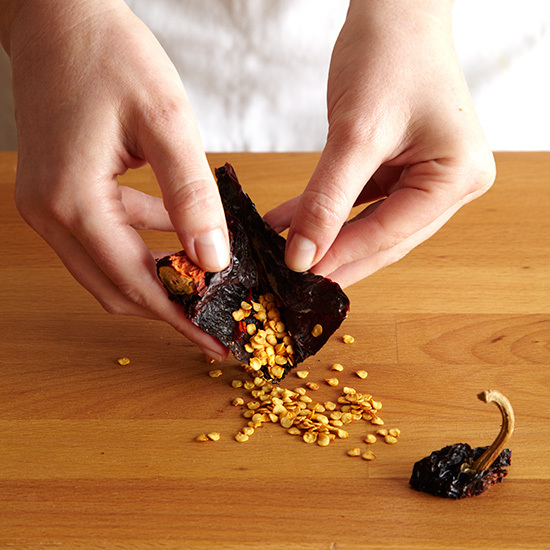 Remove the seeds from the chiles. 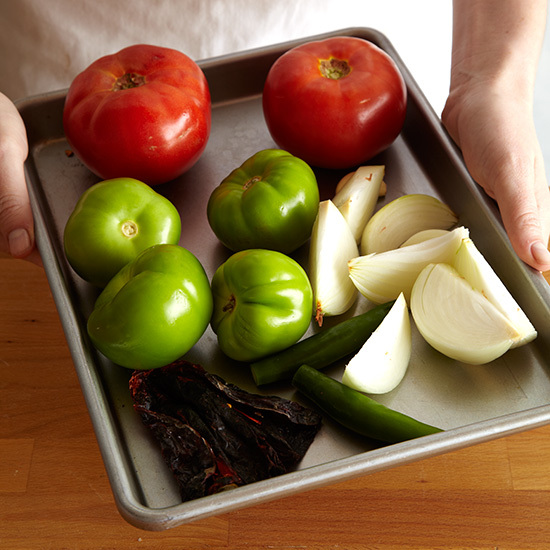 On a rimmed baking sheet, spread the tomatillos, beefsteak tomatoes, serranos, pasilla, onion and garlic. 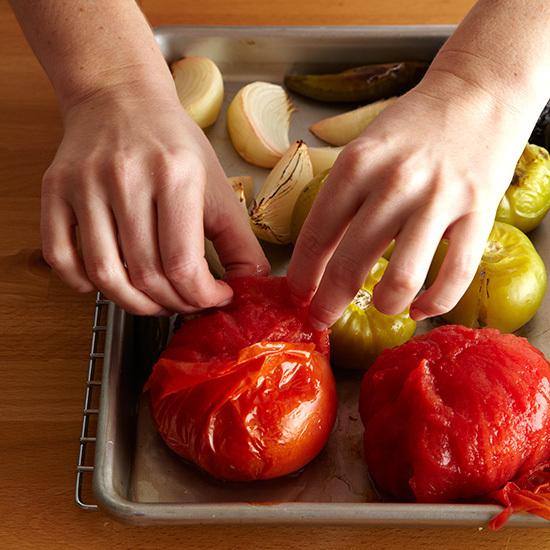 Roast the vegetables in the center of the oven, turning them once or twice, until softened and lightly browned in spots. Peel and core the beefsteak tomatoes and cut the flesh into quarters. 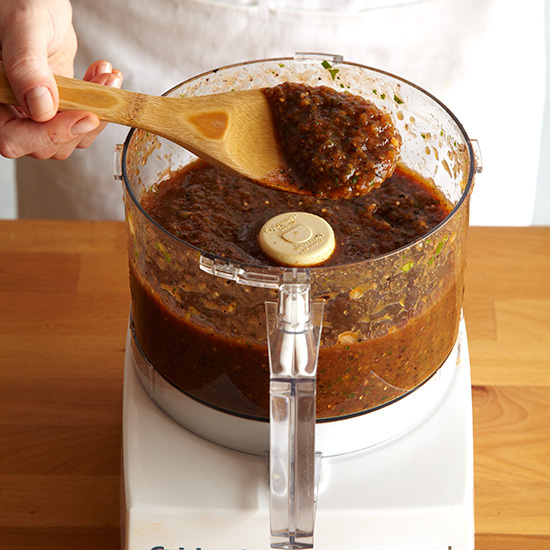 Crumble the pasilla chile into a blender or food processor and add the remaining roasted vegetables and any juices. Add the cilantro sprigs and lime juice and puree until smooth. Season the salsa with salt. 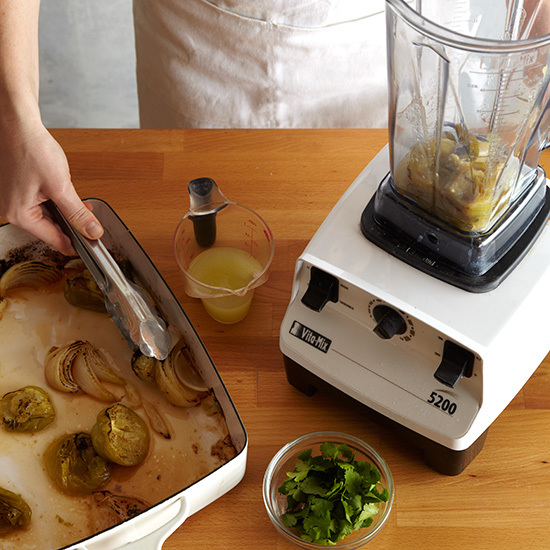 Let the tamales cool for 15 minutes before serving topped with the tomatillo-cilantro salsa.